The high plains stretch from Grand Island, Nebraska to the Rocky Mountains in the west. The countryside gains altitude as it goes west and the air gets dryer. In addition, the winter temperatures become milder with the altitude, lack of humidity and the brilliant sunshine. This is farming country with small towns and villages and thousands of acres of wheat, corn, and beans. It is also an opportunity for ducks and geese to hang around as there is plenty of food, water and sand. I know when God looks down on the land and the people here He is pleased. Chimney Rock is one of the most famous and recognizable landmarks for pioneer travelers on the Oregon, California, and Mormon Trails, a symbol of the great western migration. 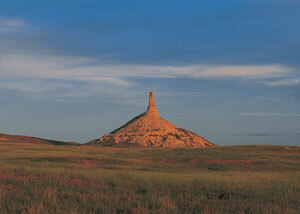 Located approximately four miles south of present-day Bayard, at the south edge of the North Platte River Valley, Chimney Rock is a natural geologic formation, a remnant of the erosion of the bluffs at the edge of the North Platte Valley. A slender spire rises 325 feet from a conical base. The imposing formation, composed of layers of volcanic ash and brule clay dating back to the Oligocene Age (34 million to 23 million years ago), towers 480 feet above the North Platte River Valley. My wife is from Sidney, in the panhandle of the state and is home to Cabelas. Before Bass Pro came to Council Bluffs, a lot of sporting goods were purchased by me at the store in the town. Whenever we visit the town, we visit the store. Every time we drove west in the fall and winter, the ducks and Canada geese were very plentiful as we traveled along the Platte river. West of North Platte the river has separated into two streams, the North and South Platte each going in a distinct direction. This is duck and goose heaven. Last summer I decided not to renew my membership in the club I had hunted for 17 years. The owner of the land and leader of the club had died and it just wasn’t the same. In addition, the hunting was poor as the birds seemed to stay longer in South Dakota, and there was now six hunting blinds in a square mile. That was too much competition for me. After a search of commercial hunting spots in three states, it was decided to go with Central Nebraska Outfitters. Jim Martinosky came with some good references from people I know in the area. (www.centralnebraskaoutfitters.com) Follow the link to learn more of the operation. Jim recommended several times to come out and all of them were later than what I have been used to. That is because the season is longer and later in that part of Nebraska. You can hunt ducks and geese in January and that month can be the best of the season. January across Nebraska does take a risk. While the weather is generally milder than back east, the land can get some really rough weather in the form of severe blizzards. I did not feel the risk was worth it. and settled on mid December. Invited were several people like myself that I had hunted with over the years and were also former club members. They agreed that to play it safe with the date. Out of the three people I asked to go along, only one could make it on that date. While Jim prefers three to four hunters at a setting, we still hunted with only ourselves and the guide. Paxton, Nebraska is a village of about 523 people. The highlight of the town is Ole’s Big Game Bar and Steakhouse. Ole was a big game hunter and hunted all over the world. The restaurant is famous as it is full of mounts Ole harvested in his trips across the world. He must have spent a fortune on traveling the world and hunting. Besides a couple of places to eat, there is a Days Inn on the south edge of the town and it is neat and clean, and we stayed there the duration of our trip. You walk in the door at Ole’s and you are greeted by a polar bear in a glass box. Inside Ole’s you are greeted with mounts everywhere that Ole has shot and collected. Jim’s son Riley was our guide and met us at 05:15 our first morning. The most important member of the group was Riley’s black lab, Slam. This fine boy was probably one of the best and behaved labs I have ever hunted with. He is a two year old and Riley has trained him well. Labs are generally social, but not always and this was the case. Slam was a one man dog and stayed close to Riley whenever we were out of the blinds. He just basically ignored us and I have seen this before. We went to the South Platte river to start the hunt. The company has leased land along the South Platte and one of their blinds was positioned on the bank. The first thing I noticed was that the bank was quite high and we were elevated above the river. The river was not more than knee deep and had a sand bottom. Riley did not want us to wade out as he took care of this himself. He put out two dozen decoys in the calm water. The current looked quite swift but was narrow so there was lots of calm water around and next to the bank. Sand bars were everywhere and the river just wound its way through the bottoms. Morning on the South Platte River. Notice the ice flows on the river. The company manufactures blinds and these are excellent. Made of one inch square tube steel, they are then wrapped in canvas and native grass covering the blind. Roomy inside, there is room for four to five hunters with seating and a shelf in front of you to pile shells and other things we buy at the sporting goods store and never use. We all buy various pieces of junk and never use it, but we bring it anyway. make this blind a perfect hiding place. There was slush ice in the river as the temp had been well below freezing during the night, but as it got lighter the temp came up and the ice disappeared. Ducks and geese would fly up and down the river. This would be a new type of shooting for us. A couple of Teal came in and we scared the daylights out of them. Then they flew away. I commented that this was the first time dead ducks had every flown. Ducks in small groups would work us, but did not come in for a shot. We also had some geese that came up the river at tree top level, and we scared them also. It was more like pass shooting and neither one of us was prepared for that type of hunting. We were used to lake hunting where the birds circled, locked up and came in. Looking up river. The decoys are next to the bank and on the opposite side in the calm water. After the sun had risen fully the traffic just stopped. It was time for lunch and we needed to make new plans. The Windy Gap in Paxton sells lunch and dinner. The food is just basic and good with plenty of it. Riley wanted to move to one of the sand pits near the interstate. These ponds existed because material was dredged out for road bed when the interstate was built. We had a really strong northwest wind and we would be in layout blinds next to the calm water with the wind at our back. This was a new experience for both of us. The decoys were put out in the calm water and we were about ten feet from the waters edge in the layout blind. There is a right way and a wrong way to function in these blinds. Getting in and out is not easy for old dogs like myself and my hunting partner. You must rise up from a partially laying down position and the side covers will pop open. I found that laying my gun on my right side would not give me time enough to mount the gun to my shoulder. The solution was to lay the gun on my chest with the barrel pointing out the bottom end of the blind. This way the gun would be pulled up into my shoulder as the sides of the blind popped open and I rose up. lock up and come straight into your face. It can’t get easier than that. We started hunting around 2:30 PM. It not take long and a flock of ten came into us. With the wind at our back they came straight toward the blind and right in our face. We screwed this up due to not being able to function properly in the operation of the layout blind. This was a learning curve. Shortly after and a discussion on how to function, a single Canada came to us, locked up and my hunting partner popped up with the gun mounted in his shoulder and plunked a really nice Canada. The dog was out side of his hiding place at his master’s command and into the water to retrieve the goose. Watching the dog work is the highlight of any hunting trip. The sun hit the horizon in the west and it was time to fold it up. While we only had one goose for the day, the experience was a really good learning curve. The plus side was doing some different kind of waterfowl hunting that we had never done before. Tomorrow is another day. Start with 2-4 duck breasts. Remove all silver skin and sinews. Place between layers saran wrap and pound thin (less than 1/8″ thick) with a meat mallet. Place in a Tupperware container and cover with buttermilk. Leave in the refrigerator for 3 days. Remove and pat with paper towels. Mix 1 cup flour with ¼ cup of any Cajun spices shake well to mix. Cover the moist breasts in the mixture, shake off excess. Beat 2 eggs and ¼ cup milk. Mix 1 cup bread crumbs and ¼ Cup Parmesan cheese topping. Heat 4 tablespoons of olive oil and 1 stick of butter over medium heat. Dredge the breasts in the egg wash then cover with the crumb/cheese topping. Over medium heat, fry the breasts until golden brown and medium rare, don’t overcook or burn them, adjust the heat as necessary. Cover with a jar of brown mushroom gravy (any brown gravy will do). Serve with au gratin potatoes and red cabbage.